Yesterday I suddenly decided that I HAD to get my ears pierced. As soon as possible. They'd been pierced when I was young, but they closed up long, long ago. The only place I could think to go to was Claire's. Not that there's anything wrong with Claire's, but I don't believe I'm exactly their usual clientele. 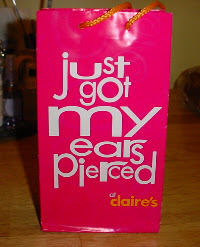 So this morning, off we went to Claire's. The young lady there did a fine job. And it only hurt for an instant. And Jake feels he has even more reason, now, to believe that I'm completely off my rocker. But don't they make my earlobes look fat? The cute bag my care kit came in. And, in other news, Blogger finally got the best of me. I went to sign on, and it first teased me by giving the option to sign in with new or old blogger, but after I signed in with the old, I was taken to a screen that laughed at me endlessly, until I agreed to sign up for New Blogger. After I surrendered, it promised that it would move my blogs over in just a few minutes. Then it suddenly changed it's mind and decided that it needed more time, and it would email me when it was finally ready to let me back in. After laughing at me for a few hours, it finally did. Whoopie. You've just made me relive my piercing, which I was surprised to remember wasn't to traumatic. It was just a quick nip. Getting my belly button done was sorer, but even that was only sore for a little while. 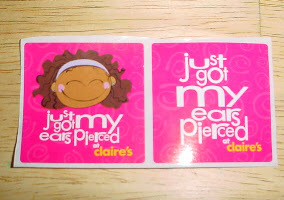 I miss getting my ears pierced! I've gone in on...six occasions. 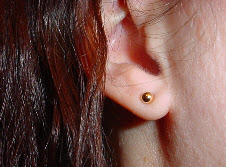 In my earring hey-day I had three holes in my right ear and four in the left. I am currently down to two in each ear (I think). Most days I don't wear any. Ahahahahaha. Eileen, that was awesome. I got my ears pierced when I was four. I remember being SO excited. I think I would have gotten my belly done at that time if my mom had let me. Hee! Yes, I'm a big girl, now! And Meg, my reward for losing all my weight is a tattoo. So maybe someday I will get a tattoo with you. Excellent! Just think of all the pretty earrings you'll have to buy now. Muahahaha!